“I knew when I took this job we needed to up our game in every community,” Perez said. 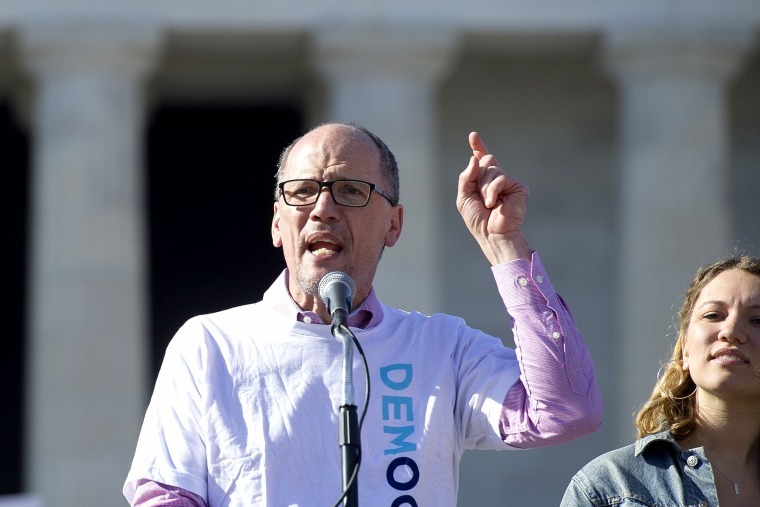 “I knew when I took this job we needed to up our game in every community,” Perez, the first Latino to head the Democratic Party, told NBC News on Monday. Perez said work started before the midterm election cycle and included helping to get Annette Taddeo elected to the Florida state Senate and increasing the Latino vote for Democratic wins in Virginia. The party has invested upward of $3 million in 15 states in the run-up to the midterms on organizing, voter registration, digital strategies, radio ads and more. “And I’m proud of the work we’ve done,” Perez said. The remarks were in response to recent news reports about critics questioning whether Democrats have done enough or spent enough this midterm cycle to get the more than 29 million Latinos who are eligible to vote nationwide (according to the Pew Research Center) to do so. Latino voters tend to vote Democrat, although their political leanings differ in various parts of the country. A Latino Decisions tracking poll, which has been cited in several reports, found that more than half of Latinos said they had not been contacted about the election. A greater share of those who had been said it was by Democrats. The latest national NBC News/Wall Street Journal poll found 71 percent of likely Latino voters said they have high interest in the midterms. In the most recent Latino Decisions poll, 85 percent of Hispanics polled said they were certain to vote or probably would vote. Yet getting Latino voters engaged in midterms has traditionally been an uphill battle. At a recent meeting in South Florida, organizers from the Latino advocacy organization UnidosUS who were working on voter registration noted that many area residents were not aware of the upcoming midterms. Perez said while Beltway consultants do important work to build organizing capacity, the party's lion share of investment "has gone to people in the field." Democrats have worked on several fronts to engage Latino voters, according to Perez and background provided by the party. It has helped pay for 20 organizers in communities considered its base, which includes Latino communities in El Paso, Texas; Minneapolis; Salt Lake City; Las Cruces, N.M.; and Oklahoma City. In Arizona, the party hired two Latino field organizers who started in early summer. In California, the party’s state grant program helped pay to hire the first Latino constituency director; in Florida, the party helped to fund organizing efforts in Puerto Rico neighborhoods. The party said engaging the Puerto Rican diaspora and those who relocated from the island to Florida, Pennsylvania and other places following Hurricane Maria has been a priority. The party purchased about 300,000 cell phone numbers of Puerto Ricans who relocated to Florida and about 25,000 Puerto Ricans and Dominicans in Pennsylvania for voter outreach and mobilization. Manuel Gomez, coalitions director of the Pennsylvania Democratic Party, said the phone numbers have been a big help in reaching people and then showing up at their doorsteps for conversations about the party and to urge them to vote. “It’s important to note this is the first time the DNC has made this type of infrastructure investment in Latinos since I’ve been around,” said Gomez, 30, who became politically active in 2008 for Barack Obama’s first presidential run. “This is the first time they’ve really emphasized Latino and African American outreach,” Gomez said of the national party. Perez said that more Democrats have registered to vote than Republicans in Pennsylvania part because of the party’s work. And in Wisconsin, the party began organizing Latinos and African-Americans, and that helped the party elect a state Supreme Court judge in April. Baldwin, a Democrat seeking her second term in the Senate, is being challenged by Republican Leah Vukmir in a race Cook’s Political Report rates as likely to remain in Democrats' hands. Cook's rates Wisconsin governor’s race a toss-up between Republican incumbent Scott Walker and Democrat Tony Evers, the state’s superintendent of public instruction. He has sought to hire organizers from the state where they are working and the lion’s share of investment “has gone to people in the field, not Beltway consultants,” he said, adding that while consultants do important work to build organizing capacity, the party had to go directly to communities. In Georgia, Genny Castillo was working as a legislative aide for Democratic gubernatorial candidate Stacey Abrams when she was hired by the party to do Latino outreach for the party’s Georgia coordinated campaign, which means her outreach benefits all of the state’s Democratic Party candidates. Of Dominican descent, Castillo said the state is seeing growth in its Dominican population as well as people of Mexican, Colombian and other South American and Caribbean descent. Castillo said critics are missing the outreach that is happening on the ground, including some of the door-knocking she’s been doing herself. “People are on the ground because it’s about talking to voters,” she said. With another trip planned to Los Angeles, Perez said it’s no coincidence that he's stopping at so many Latino-heavy areas.